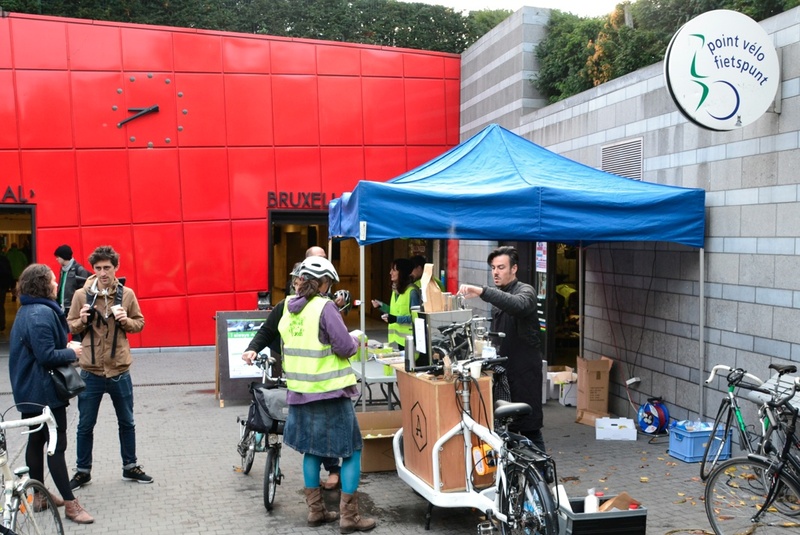 This morning, Belgium’s cycling advocacy groups, GRACQ and Fietsersbond, celebrated commuting cyclists in Brussels with another free breakfast opportunity for those who brave the early hours. For the morning riders this year, a chance to get a pair of USB chargeable lights for the bike. It made this autumn ride one of the best experiences. Even better this year, the weather was perfect for an autumn morning. I rarely get to these events. Schedules demand other routes, meetings force the wrong travel times, and I miss out. And, later in the day, there is the stream of friends who rode the right routes at the right time. Jealousy is often a personal characteristic of today. GRACQ and Fietsersbond are two highly visible cycling advocacy groups in Belgium, representing French and Dutch speaking riders respectively. The nieces part if the cooperation between the groups as they often share events or campaigns. This entry was posted in advocacy, bike shop, commuter, Europe, family, social engagement and tagged 2015, Fietsersbond, GRACQ, October. Bookmark the permalink.